"We quickly felt at home..."
Can you tell us a little bit about yourself and what brings you to Kuwait? We moved here in September 2017 with my husband’s work. We have a one year old boy (who keeps us on our toes) and we very much enjoy Kuwaiti life so far. What were your reasons for joining Al Corniche Club? When we first arrived in Kuwait, lots of people we met told us we should join and we were given a tour around the club – needless to say we joined as members instantly! It became apparent that the Corniche could be a lifeline as we quickly met lots of lovely people there, many with children at similar ages to our son. The added bonus was that with the crèche, it opened up the possibility of proper exercise for the first time since he was born. Beautiful and peaceful. I was expecting it to feel packed and it just wasn’t. I was also made to feel so welcome, not just by staff but by other members. We quickly felt at home at the Corniche. It’s hard to say just one thing to be honest, it has fast become a haven for me and my family. One of the key things I would say, is it’s a place for me – I can always find a quiet space for a mini escape, such as sitting under a palm tree on the beach, but likewise you can always find someone there you know to grab a coffee with. I’m enjoying trying out the classes and learning new skills I just wouldn’t have done elsewhere – I haven’t played tennis since school but I’m loving the weekly class on Wednesdays! I’ve also joined the swimming classes for adults as I’ve never been a strong swimmer but Caroline has been amazing and given me so much more confidence. It’s also a place for our family – our son loves the bouncy castle on the weekends and playing in the children’s area. His swimming lessons have been absolutely fantastic and like mine thanks to swimming instructor Caroline, his confidence has greatly improved. I obviously have to mention the amazing team too. I’m always amazed at the welcome when you first arrive and the staff in the restaurant in particular are incredible with my son. Can you share 3 photos with us that best describe your Corniche life and tell us a little bit about them? 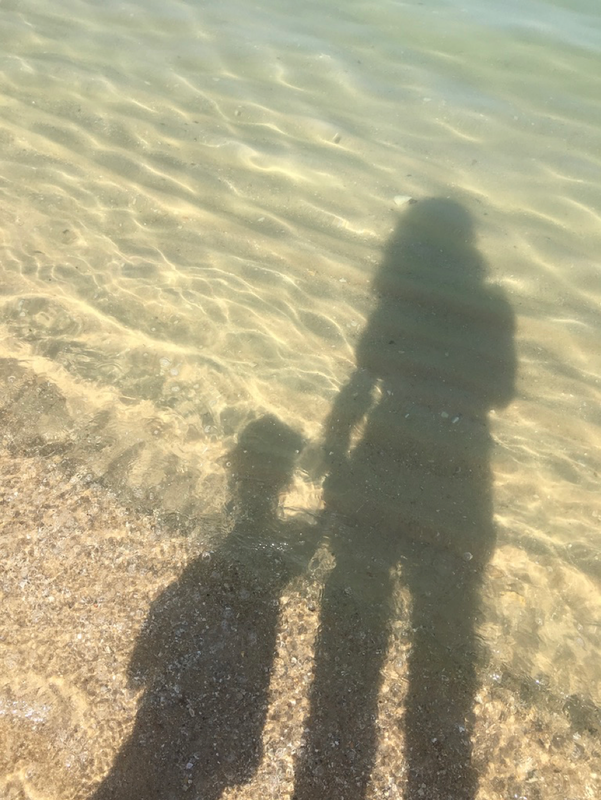 One of my favourite things to do, is to go to the beach with our son. He loves to paddle in the sea and throw a ball around on the beach. What other gym has this view from a treadmill?! It actually makes me want to workout for a change! Another photo showing how relaxed life is at the Corniche for us as a family. We love going to the beach with a smoothie. Would you recommend Al Corniche Club and if so, why? Absolutely. I think if it wasn’t for the Corniche, we wouldn’t feel half as settled and at home in Kuwait as we do. I’ve made some great friends thanks to the club but I’m also getting fitter. Thank you to Lizzie for her lovely testimonial. If reading this has inspired you to try something different and #giveitago, click the links below for more information.